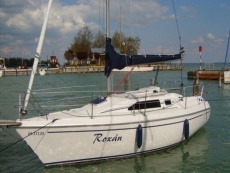 The Dolphin 28 boat is ideal for lake Balaton in terms of comfort, crusing characteristics or equipment. 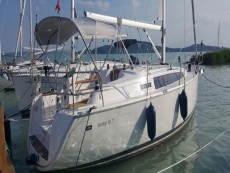 It is an easy-to-sail boat with a spacious cockpit, allowed to have 7 people on board. It has a wide, perfect layout main cabin especially compared to what you would expect from an almost 29 feet boat. The height of the salon is more than 190 cm . In Dolphin 28 there are two separeted cabins in addition to the salon , a bathroom/toilet room and a kitchen-corner. 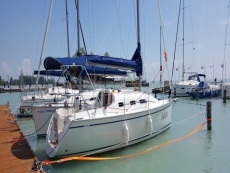 The boat is equipped with depth-meter, microwave-owen, LCD Tv, Fridge and with the many other equipemtns is a good choise for a sailing-holiday.